As an example, an international school wanting to implement a new system like Google Apps for Education only needs to formally train 20% of the end-users in each user group (Administrators, Teachers, Students, etc.). 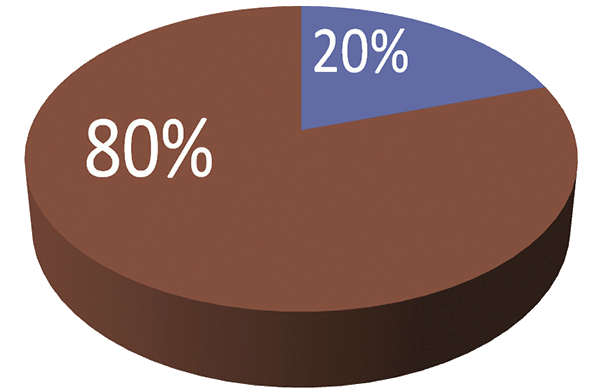 This 20% can then work with the remaining 80% to achieve the desired results; results which are often very niche and vary by division and department. In another case, consider a school purchasing Microsoft Surface Laptops for their staff. Only 20% of the end-users need to have the full training on the hardware and software in order to fuel the future deployment. The optics of 100% are not really fair when the majority of the 100% are not actually gaining the information and skills need for mastery. In education there is always pressure on students to reach mastery. That same expectation should be placed on everyone, and embedded in every initiative. Organizations working towards a good introduction, are not working towards their full potential. Randomly selecting 20% of a group to master a new PD initiative is a mistake. That would only work if the entire group were known equals. New and existing staff should be surveyed to identify their current knowledge and aptitude. Identifying aptitude is essential. New initiatives tend to have a limited experienced population within the organization; but aptitude is around every corner. Years ago I took the 80/20 approach when switching a very large campus to Apple. I made certain all required hardware and software was available for 20% of the staff before summer. I selected the staff based-on their current familiarity with Apple and their ability to work with their colleagues. The switch went very well, and after about three weeks the technology support issues declined by 75% from the previous year. The switch to Apple while following a 80/20 implementation plan reduced the non-Apple issues as well as the issues with the new hardware. Recently, using an 80/20 plan, I sent a core group of people for training on a new school information system. Those people were tasked at training, and evangelism, within a hostile environment. Knowing the system was actually in competition with other plans, a final meeting was held to determine if the school would continue with the new information system. The option was on the table to remove the new and bring back the old. The old was rejected. I do not believe this would have been possible without the core 80/20 group. Keep in mind during each of these difficult transitional experiences the remaining 80% were not always happy. They new change had arrived, they were being delayed access at different stages, and they were not being trained or equipment immediately. This was noise. And noise should never dictate a plan or process. The optics of 80/20 do not look as “nice” compared to working with 100%. However, the outcomes will be fair, balanced, and better. Most importantly, those suffering in silence will have a smaller more agile group for support. Take a chance. Make a change. Go for 80/20. This entry was posted in Tony DePrato and tagged 8020, learning, Pareto, PD, Sharing, Strategy. Bookmark the permalink.